John Morris, a Florida-based travel writer (wheelchairtravel.org), uses a power wheelchair for mobility. 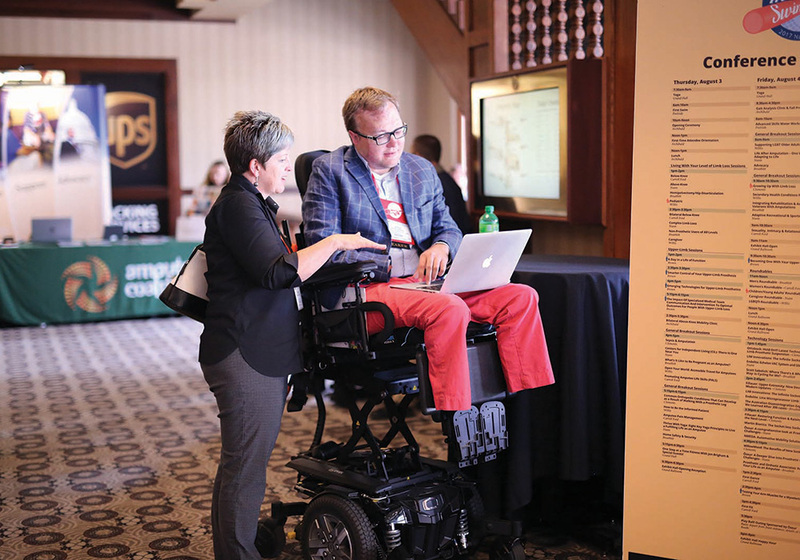 He has explored the accessibility of dozens of public transit systems while on the road in both the U.S. and on four continents. He says that virtually every city in America has a long way to go before they truly offer inclusive mobility. "City planners often fail to recognize the true cost of accessibility barriers in transportation and movement. Just like our able-bodied counterparts, people with disabilities are on a schedule and have places to be: jobs, meetings, appointments, dinners, movies, concerts, sporting events, flights to catch, etc.," Morris says. "Barriers to accessibility disrupt freedom of movement and place additional hardships on those who use wheelchairs or other assistive devices." At times it's a simple lack of communication and coordination among the professional disciplines — planners, architects, traffic engineers, public works field staff, downtown development authorities, community reinvestment authorities, and private developers changing or designing rights-of-way. Likewise, a pedestrian activation button on a raised sidewalk out of the ADA-accessible part of a curb ramp makes it nearly impossible for a wheelchair user to cross under the safety of the "walk" light. Photos courtesy Perils for Pedestrians, Pedestrians.org. For more than half a century, Los Angeles has been famous (some would say infamous) for being the most car-centric place in the Western world. That makes getting around a lot harder for people with disabilities. Accessible consumer van upgrades — adapting for lifts, ramps, safety tie-downs, and automated systems that allow for transfer from a wheelchair to the driver's seat — can cost upward of $75,000, and thousands more per year to fuel, maintain, insure, and park. But all of that is changing with development of the Los Angeles County Metropolitan Transportation Authority's 105-mile Metro Rail system. In 2016, county voters approved a sales tax that will generate nearly $1 billion per year for transit and related improvements. Measure M, the dedicated tax, will roll out another 32 miles of rail service in the next decade alone — all of it fully accessible. At full build out, Measure M could potentially double the rail network in Los Angeles County, and add bus rapid transit lines and pedestrian infrastructure. That isn't the case for older, legacy systems, notes research published in London's The Guardian. In Paris, nine of 303 metro stations are fully accessible and only 50 out of 270 London Tube Stations are. New York gets a poor grade, too, with just 117 of its 472 subway stations fully accessible. But progress is being made in other major U.S. cities. 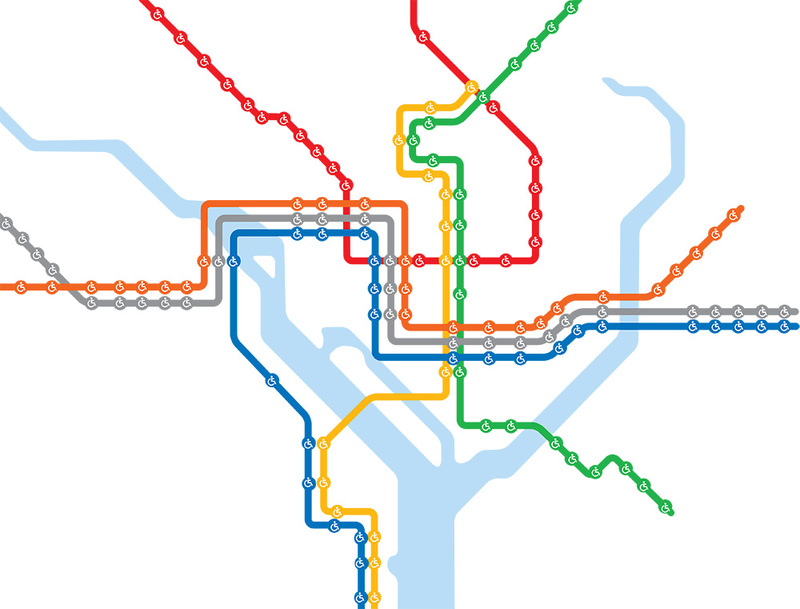 Washington D.C.'s 91 Metro train stations are 100 percent accessible, and in Chicago, where some elevated and other rail stations were built long before the ADA was passed in 1990, 67 percent of the Chicago Transit Authority train stations are fully accessible to people with disabilities. "We need to design transit systems that everyone in a community — regardless of money, or physical or cognitive ability — can use," says Jana Lynott, AICP, manager of AARP's transportation research agenda. "People who have mobility constraints really need access to transit," says Bill Delo, AICP. "They are a big market for transit ridership — but only if they can get from their home to transit to their place of work, on wide sidewalks with safe crosswalks." The plan advocates for universal design, stating: "Most public transportation stations, trains, and buses are accommodating to manual wheelchair users; however, they have historically been treated as an isolated group, with limited number of spaces on buses. "As the population ages and more manual and electric wheelchair users ride public transit, new seating configurations and storage may be required. 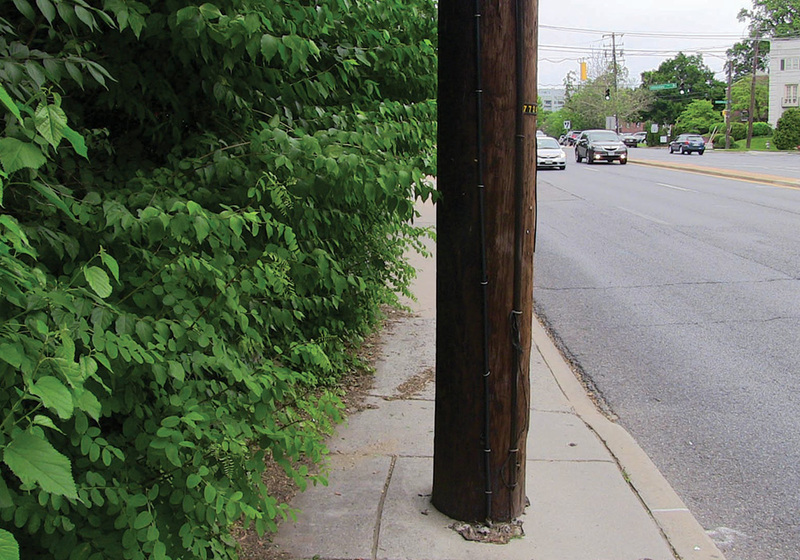 Sidewalks and routes to transit nodes must maintain smooth and clear rolling surfaces, accessible curb ramps, and signal times conducive to safe street crossings." LA County tackled this head-on when it adopted the First Last Mile Strategic Plan (tinyurl.com/ya68mr7n) in 2014. The plan focuses heavily on inclusive design to serve people with disabilities. The progressive, innovative plan was honored with the American Planning Association's 2015 National Planning Excellence Award for Best Practice (www.planning.org/awards/2015/firstlastmile.htm). "We looked at this as an opportunity to go beyond the typical mobility plans that look at bike and pedestrian mobility then stop ... to increase access for people who use wheelchairs, scooters ... even skateboards," he says. 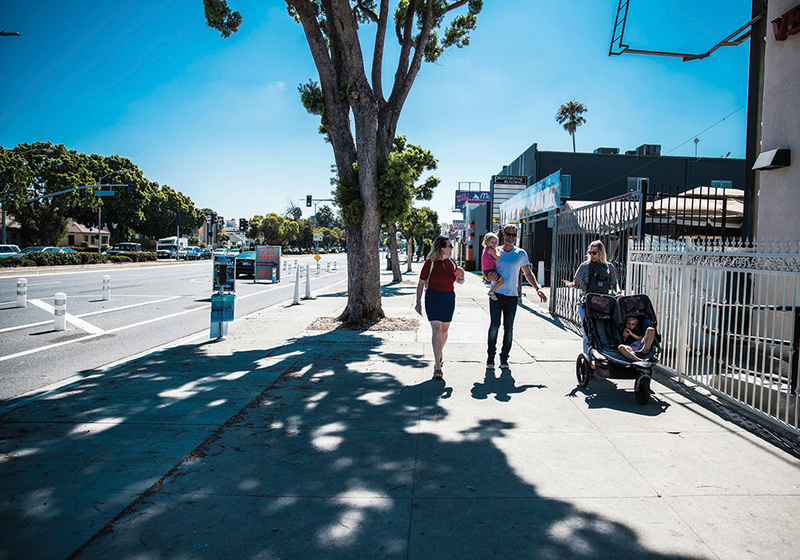 "We wanted to improve accessibility for everyone who commutes by transit [in] Los Angeles." Delo says that a key to a better first- and last-mile experience is widening sidewalks and making sure they are well maintained. "People have many different ways of getting around without a car, but they all — other than bicyclists — are restricted to the sidewalk." "I see many communities that need to invest in access for people with disabilities to both public transit and sidewalk networks. And they need to have Americans with Disabilities Act transition plans that are updated on an ongoing basis," says Lynott. An ADA transition plan is a state or local government's self-evaluation of its facilities, programs, and services to assess whether the government is in compliance with ADA rules. Problems and shortfalls are identified and a plan is put in place — with action steps and deadlines — to address them. "Transition plans serve to connect people with disabilities to jobs and services," she says. "This has a direct, positive economic impact." "I think when agencies focus only on the Americans with Disabilities Act, they can get too focused on just meeting minimum ADA requirements. That's when we lose track of truly making a place accessible for people with disabilities," says Klein, cofounder of CityFi, an advisory services platform for urban change management, and author of Start-Up City: Inspiring Private and Public Entrepreneurship, Getting Projects Done, and Having Fun. "In Chicago, I had a great relationship with the Mayor's Office for People with Disabilities," he says. "We focused on practical solutions. We didn't want to just look at numbers in a book, we wanted to have people with disabilities come in and help with our design from the ground floor. That way, you didn't just have a ramp to meet the ADA laws, you had a ramp that functioned, even in the Chicago winters." "When we came up with our complete streets guidelines, the idea of designing for people with disabilities wasn't an afterthought. It was a priority to design inclusively from the start, because we found if you design for people with disabilities, the able-bodied people will be just fine," he adds. 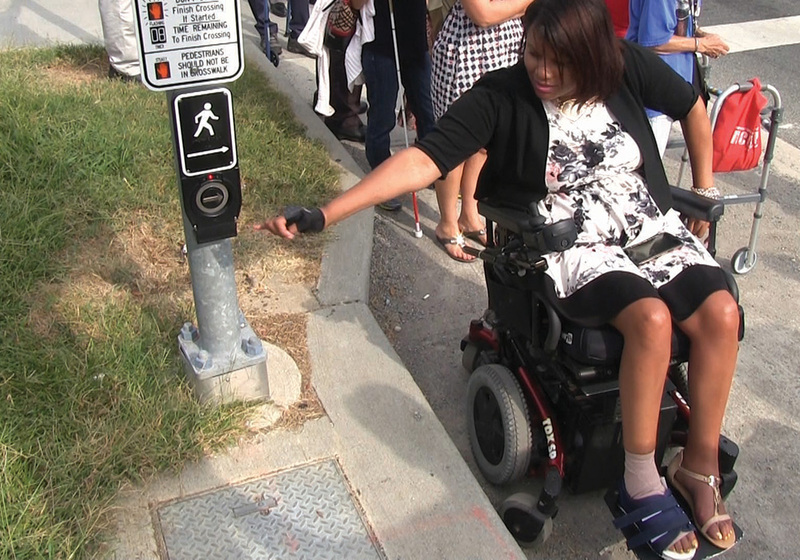 In 2015, the National Complete Streets Coalition, a part of Smart Growth America, published "Complete Streets Help People with Disabilities." The complete streets approach, says Emiko Atherton, the coalition's director, "means that transportation decisions, plans, and procedures are aligned and designed to accommodate all users of all abilities." The two-page guide notes that "Complete Streets policies provide flexibility to transportation professionals and give them room to be creative in developing solutions that promote accessible travel," noting that designers should think about important details at intersections (like audible or tactile signals for blind pedestrians); smooth, obstacle-free sidewalks; and ample space to wait and board safely at transit stops. Further, such policies "remove barriers to independent travel by considering the needs of all users at the outset of every transportation project," the guide reads. Considering all users helps keep people connected, which improves livability, and can reduce "dependence on more costly alternatives, such as paratransit or private transportation service." "It's one thing to understand the law and the regulations, but another to understand the design experience. All of us as planners need to wrap our heads around the principles of universal design and think through what that means," says Lynott. "One of our chief concerns is equity, says de la Pena. "The city has a very robust equity plan and our concern about these new options is that they offer mobility." The playbook's suggested solution is to develop a "Wheelchair Accessible Taxi program to reduce operating costs, meet customer expectations, and work more efficiently across jurisdictional boundaries." The playbook acknowledges that while much of tech-driven new mobility is owned and operated by the profit-minded private sector, government "must ensure that shared mobility services provide dignified, reliable, and affordable transportation options that are accessible to all." Further, the New Mobility Playbook notes that "mobility options and technology must fight against the displacement of vulnerable communities and develop the living wage transportation workforce of tomorrow," and its Strategy 1.1 notes that best practices for cities and regions grappling with the onslaught of smartphone-app-driven mobility must "advance shared mobility equity programs targeting people of color, low-income, immigrant, refugee, youth, and aging populations, women, LGBTQ, and people with disabilities." 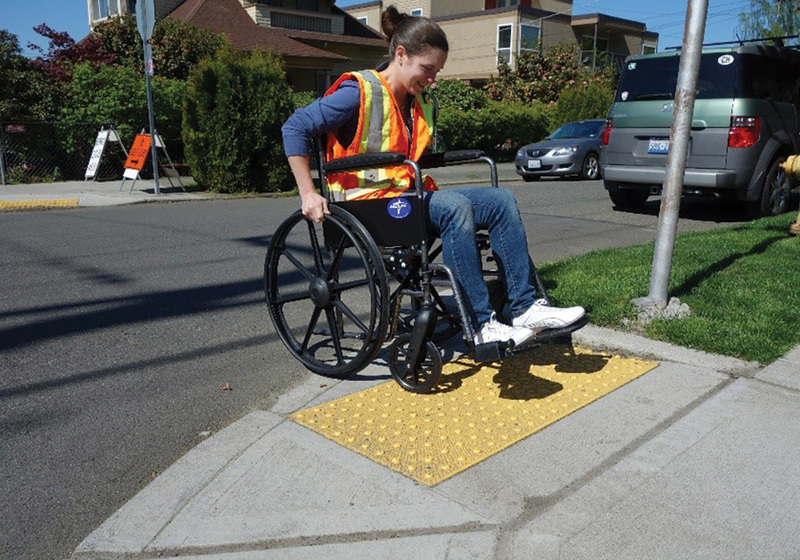 Working directly with people of diverse abilities also helps inform the planning process in Seattle. Inclusion is not only a best practice, it is required, notes de la Pena. The city's advisory boards "have members who use wheelchairs for mobility, people with low vision, people with other disabilities. And we listen to them." It's a practice John Morris certainly advocates. "ADA compliance consultants should have a personal experience with disability and be able to understand the needs of the disabled population," he says. "In larger cities with a large population of disabled citizens, multiple consultants should be brought on board, each specializing in an area of accessibility, but also participating in team planning and discussions." "The perfect ADA team," he adds, "might include a wheelchair user, deaf/blind expert, and an expert in intellectual disabilities."